The President of the Basic Court Skopje 1, Judge Ivan Dzolev, commenting on the issue whether the President of Macedonia can pardon convicts for the “27 April Parliament Incidents” case, says that the court has not received abolition requests on this case so far. “It is a fact that the President has the right to pardon convicts. The verdict documentation for the convicts in the case of the Parliament incidents is not ready yet, and the deadline is 60 days after the court reaches the verdict. At the same time, we are waiting for the Appeal Court to return to us the cases “Tank” and Trust” of the Special Public Prosecution (SPO),” Dzolev said at a press conference. In meantime, SDSM MP Snezana Kalevska-Vanceva stated in a press conference that President Gjorge Ivanov must not provide abolition to the convicts from the “27 April Parliament Incidents” case. 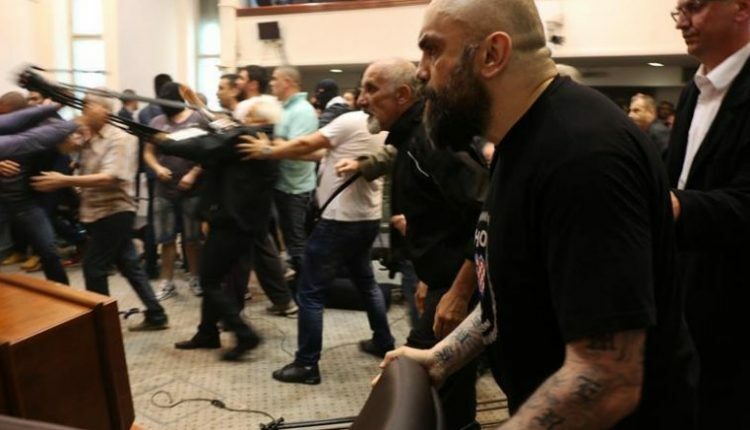 “These people were sentenced for anti-state actions, and if they are given abolition, that can provoke another political crisis, and may bring the Macedonian society to the brink of civil war,” Kalevska-Vanceva says. Reaction also came from the association “Green Magnifier”, from where they state that Ivanov cannot provide abolition to former head of the Public Security Bureau Mitko Cavkov, because Cavkov provided donations for the pre-electoral campaign for Ivanov’s presidential candidature in 2014.